Home » Cover Story » 2015: A Good Year For Defence—Or Was It? 2015: A Good Year For Defence—Or Was It? I read this article and found it very interesting, thought it might be something for you. The article is called 2015: A Good Year For Defence—Or Was It? and is located at https://archive.indiaspend.com/cover-story/2015-a-good-year-for-defence-or-was-it-94891. 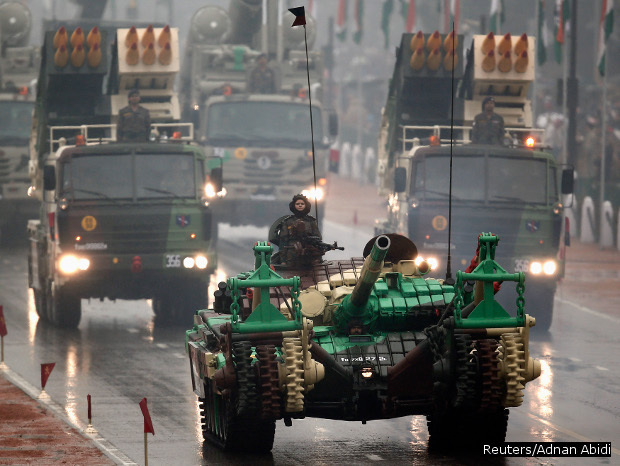 The year 2015 witnessed a hike of nearly 10% in India’s defence budget, from Rs. 2.2 lakh crore ($33 billion) in 2014-15 to Rs. 2.4 lakh crore ($36 billion). Money for capital expenditure—to buy new equipment—rose 15% over the previous year, but much of this was set aside for expensive imports, as this report will show. The most significant development of 2015 was the scrapping of the $20-billion (Rs 1.45 lakh crore) Medium Multi-Role Combat Aircraft (MMRCA) deal for the purchase of 126 French Dassault Rafale fighter jets. Expense could have been a major reason, IndiaSpend reported. To boost squadron strength, the government cleared the off-the-shelf purchase of 36 Rafale aircraft in fly-away condition from Dassault’s factories in France at an estimated cost of $8-9 billion (Rs 52,800-59,400 crore). India’s defence ministry and Dassault discussed costs over the year. A deal could be signed when French President Francois Hollande visits India next month as chief guest for Republic Day. 2015 has been a good year for India’s helicopter fleet with three major deals: The purchase of 15 Chinook heavy lift helicopters and 22 Apache attack helicopters from the US’ Boeing company at a cost of $3 billion (Rs 19,800 crore); and $1-billion (Rs6,600 crore) deal for 200 Kamov 226 T utility helicopters, a replacement for the air force’s vintage Chetak and Cheetah helicopters. The Kamovs will be manufactured locally. The biggest development pertaining to India’s beleaguered Tejas Light Combat Aircraft (LCA) is a decision to possibly purchase as many as 20 basic Mark 1 and 100 improved Mark 1A variants, after delays in development of the more capable Mark 2 version. The Fifth Generation Fighter Aircraft being developed jointly by India’s Hindustan Aeronautics Limited (HAL) and Russia’s Sukhoi is currently stuck due to differences between both sides. The development of India’s own indigenous fifth generation Advanced Medium Combat Aircraft (AMCA) is on. India cleared a $430 million (Rs-2,900 crore) deal to buy 145 BAE M777 ultra-light howitzers from the US-arm of the UK headquartered BAE Systems in May 2015; the first artillery modernisation deal since the Bofors scandal. The army will also receive the 155-mm Dhanush howitzers developed by the Defence Research and Development Organisation (DRDO) from the Bofors platform, eventually commissioning 114 Dhanush howitzers, each costing Rs 14 crore. These have a range of 38 km, 11 km more than the Swedish Bofors guns. The Indian army also inducted the Akash surface-to-air missiles, capable of targeting enemy helicopters, aircraft and UAVs from a range of 25 km. The Indian army cancelled a global tender floated in 2011 for the purchase of 66,000 multi-calibre assault rifles for the infantry to replace the failed INSAS rifles. The DRDO-designed ‘Excalibur’ assault rifles, now in advanced testing, will be replacements: 600,000 rifles, each Rs 60,000, according to IHS Jane’s, a defence consultancy. The sea trials of INS Arihant, India’s first nuclear-powered ballistic missile submarine (SSBN), took place in 2015. The submarine is likely to be commissioned in February next year, according to The Hindu. Another indigenous SSBN, INS Aridhaman, is under construction, and work on a third will start soon, according to this report. INS Kalvari, the first of six Scorpene-class conventional diesel-electric attack submarines, began sea trials in October this year. It is scheduled for commissioning in September next year. The navy commissioned the 7,500 tonne INS Kochi, the second Kolkata-class stealth-guided missile destroyer. The last of the Kolkata-class destroyers, INS Chennai, will be commissioned late next year. India’s first indigenously built aircraft carrier, INS Vikrant, reached an important milestone this year when it was undocked and floated in June at the Cochin Shipyard. The Navy also commissioned INS Astradharini, a new torpedo-launch and recovery vessel, developed by the DRDO to test undersea weapons. The year 2015 was a good year for testing India’s missile systems. Of the 16 missile tests in at least 11 categories, trials were successful 14 times, according to this report by The New Indian Express. Test firings of Agni I, Agni III, Agni IV and Dhanush ballistic missiles, Brahmos cruise missiles, and Astra air-to-air missiles were successful. The subsonic Nirbhay cruise missile with a range of 750-1000 km was a notable failure. The test launch of the supersonic 300-km range Brahmos missile from a Sukhoi 30 MKI fighter, scheduled for this year, was pushed to mid-2016. The Narendra Modi government finally announced the One Rank One Pension (OROP) scheme for defence personnel. The scheme will require an additional expenditure of Rs. 8,000 crore ($1.2 billion) every year and is expected to provide equal pension payments for personnel having served in the same rank for the same length of service. However, a significant section of veterans continued to protest against the government, saying they have been cheated.